"Clicker training" is an animal training method based on behavioral psychology that relies on marking desirable behavior and rewarding it. Desirable behavior is usually marked by using a "clicker," a mechanical device that makes a short, distinct "click" sound which tells the animal exactly when they're doing the right thing. This clear form of communication, combined with positive reinforcement, is an effective, safe, and humane way to teach any animal any behavior that it is physically and mentally capable of doing. Why is clicker training effective? When an animal intentionally performs a behavior in order to bring about a desired consequence, as clicker trained animals do, they are learning in a way that researchers call "operant conditioning." Animals (and people) may also associate an action, event, place, person, or object with a consequence, whether pleasant or unpleasant. The more a certain event or environment is paired with a particular consequence, the stronger the association. This type of learning is called "classical conditioning" and represents reflexive or automatic behavior, rather than intentional behavior. While clicker training initially employs classical conditioning, it quickly becomes operant conditioning as soon as the animal intentionally repeats an action in order to earn a reward. Training through operant conditioning results in purposeful behavior, while training through classical conditioning results in habitual behavior. The difference between an animal that behaves with purpose, rather than by habit, is vast. Clicker trained or operantly conditioned animals try to learn new behaviors. They remember behaviors even years later because they were aware of them as they learned them, rather than acquiring them without awareness. They develop confidence because they have control over the consequences of their actions. They are enthusiastic because they expect those consequences to be pleasurable. Why is a clicker used? The essential difference between clicker training and other reward-based training is that the animal is told exactly which behavior earned it a reward. This information is communicated with a distinct and unique sound, a click, which occurs at the same time as the desired behavior. The reward follows. Without hearing a click during an action, an animal may not connect the reward with that action. Or, the animal may associate the reward with another, unwanted action. With the click, a trainer can precisely "mark" behavior so that the animal knows exactly what it was doing. That's why clicker trainers call the click an "event marker." The click also bridges or connects the behavior and its reward, and so is also called a "bridging signal." Why use the click? Why not just a word? A click is more powerful for training than a spoken word because it is not a sound heard by the animal in other circumstances. It means one thing only: a reward is coming because of what you did when you heard the click. It can be produced instantly and at the exact moment a behavior occurs. Even a very quick and subtle behavior, the twitch of an ear for example, can be clicked. Unlike our voices, which can say the same word in different ways, and so express different emotions or meanings each time, the click sounds the same every time it is heard; its meaning never varies. Humans are highly verbal creatures, but our pets are not. It can be difficult for them to pick out a single word from the stream of meaningless words they hear us speak every day. The click's meaning, however, is always clear. It is always directed at the animal, and it is always good news. The clarity with which a click enables trainers to communicate with their animals has a profound effect on their relationships. Their level of interaction increases, and trainer and animal become more interesting and fun for each other. How does clicker training work? The trainer clicks at the moment the behavior occurs: the horse raises its hoof, the trainer clicks simultaneously. The dog sits, the trainer clicks. Clicking is like taking a picture of the behavior the trainer wishes to reinforce. After "taking the picture," the trainer gives the animal something it likes, usually a small piece of food but sometimes play, petting, or other rewards. Very soon (sometimes within two or three clicks), an animal will associate the sound of the click with something it likes: the reward. Since it wishes to repeat that pleasurable experience, it will repeat the action it was doing when it heard the click. How do clicker trainers ask for behaviors? Clicker trainers differ from traditional trainers in that they wait until the behavior is well understood by the animal before using a command or "cue." A cue is the name of a behavior, such as "sit," or a hand movement or other clear signal. Until the animal knows what the behavior is, any name for it would be meaningless. When the animal has been clicked several times for a behavior, and then confidently repeats the behavior, showing that it knows exactly what earns it a click and a reward, it is ready to learn the name of the behavior. Clicker trainers call this "introducing the cue." To teach the animal the name of the behavior, or the cue, the trainer says or signals the cue before the animal repeats the behavior. After several repetitions, the trainer begins to click and reward when the animal does the behavior, but only after the cue is given. No click is given if the animal does the behavior without being given the cue first. The animal quickly learns to listen or watch for its cue, which tells it: If you do this behavior now, you will get a click and earn a reward. What if the animal does not obey the cue? Clicker trained animals want to perform behaviors for which they have been rewarded in the past. If they understand the meaning of the cue and desire the reward, they will perform the behavior. Does the animal know the meaning of the cue? Does the animal know the meaning of the cue in the environment in which it was first taught, but not in the environment in which it was given? Is the reward for doing the behavior sufficiently desired by the animal? After answering those questions, the clicker trainer revises the training process to be sure that the animal knows the meaning of the cue in all environments, regardless of distractions, and feels rewarded for the behavior. Why don't clicker trainers use punishments as well as rewards? A consequence of any behavior can be unpleasant as well as pleasant. So why shouldn't punishments follow unwanted behaviors, just as rewards follow wanted behaviors? Research tells us that punishment may decrease the frequency of an unwanted behavior, but usually results in producing another unwanted behavior. The results of punishment as a training method are difficult to predict and to control. In addition, punishment is not usually identified with an event marker. It almost always comes after the event and is rarely clearly connected with a specific behavior. In the animal's perception, punishment is a random, meaningless event. It is, therefore, less effective than the combined use of an event marker and positive reinforcement in changing behavior. Clicker trainers also feel that their relationships with their animals are stronger and more rewarding when they focus on the positive rather than the negative. Like the difference between an animal behaving with intention rather than by habit, the difference in attitude and enthusiasm between an animal that works to earn rewards rather than to avoid punishment is vast. 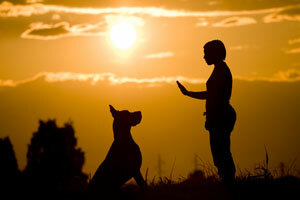 How can clicker training be used to get rid of behaviors? Clicker trainers allow unwanted behaviors to disappear through lack of reinforcement. If a behavior is not rewarding to the animal, eventually it will disappear. If an unwanted behavior persists, clicker trainers study the behavior to understand why it is reinforcing to the animal. Sometimes the behavior reinforces itself: a barking dog is less bored than a quiet dog. The barking is its own reward. The clicker trainer provides this dog with an alternate wanted behavior to replace the unwanted behavior. The bored dog may simply need more activity, or perhaps quiet resting for longer and longer periods can become a rewarded behavior. Then the clicker trainer would teach the dog a cue for "silence." Do clickers and treats need to be used for every behavior, forever? No. Once a behavior is learned and on cue, there's usually no need to click, as the animal understands the behavior. Clicker trainers can maintain the behavior by replacing specially good treats with occasional and less intensive rewards including a pat or praise. Learned cues and behaviors are also maintained by real-life rewards: for example sitting quietly at the door is rewarded by opening the door so that the dog can have a walk. Clicker trainers then save clicks and treats for the next new thing they want to train. Can clicker training be used with any animal? Yes. First widely used by dolphin trainers who needed a way to teach behavior without using physical force, operant conditioning (the scientific term for clicker training) can be and has been successfully employed with animals of all sizes and species, both domesticated and wild, young and old; all breeds of dogs and puppies, cats, birds, leopards, rats, rabbits, chinchillas, fish, and more. Is clicker training a training method or a philosophy? Sometimes people are surprised by the enthusiasm and dedication clicker trainers have for their method. These trainers may have first started learning to click as a way of training their dog, but soon realized that the fundamental principles of clicker training could be applied to other areas of their lives. Changing one's focus from the negative to the positive can certainly be a life-changing event. Podcast: What Does it Mean to Click for Behavior and Reinforce for Position?